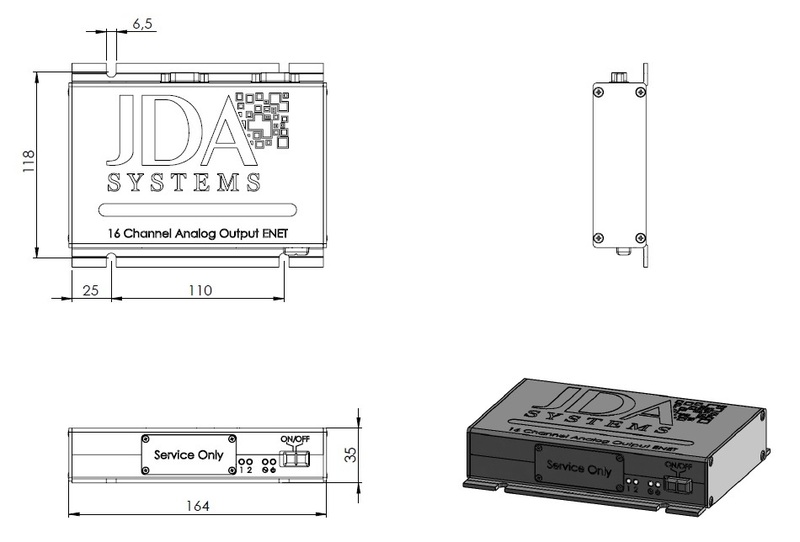 JDA Systems introduces the 16 channel Analog output ENET unit which adds up to 16 14 bit programmable analog outputs in the range of 0 -10 V each with an update rates of in excess of 1 kilo sample per channel per second and all that over a standard 100MBit/Sec Ethernet connection. Multiple units may be used in an installation with the limiting factor only being the available Ethernet bandwidth. This unique design offers exceptional flexibility in the placement of the analog output unit to best meet the customers requirements. The unit may be powered locally or as Power Over Ethernet (POE) and is fully compatible with the JDA Systems VuSoft software, or it may be integrated into other applications using the available Windows compatible API.